Android 4.4 (also now known as KitKat, in keeping with the software's tradition of dessert-themed nicknames), is expected this month. 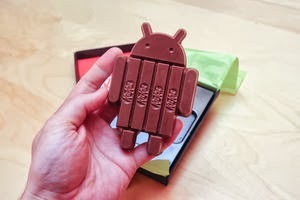 On its website, android.com/kitkat, Google says, "It's our goal with Android KitKat to make an amazing Android experience available for everybody." Still, check with your phone's manufacturer for announcements about your particular model. Even if your phone is on the list for an official update from the manufacturer, it often takes longer for the software to become available after Google releases an update. Many hardware makers have customized Android to work better on their own devices and have added their own features to it — like custom interfaces or special apps — so putting out a new version of the system often requires some extra time. And most do not bother to update software for models more than a few years old, partly because of outdated hardware and partly because of the desire to sell you a new phone.